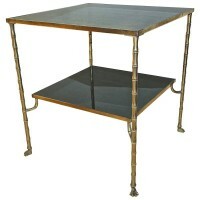 Single French Maison Baguès bronze two-tier side or end table with detailed paw feet. Warm patina with superb crafted detailing. Original black glass inset tops.